"This is my mom's holiday ham recipe. She would cook this easy recipe on my birthday. Made with maraschino cherries, sliced pineapples, brown sugar, honey and much more yummy ingredients. You'll love this ham dinner, and it's not just for the holidays, but great any time of year!" In a medium bowl, mix together the maple syrup, orange juice, ginger ale, brown sugar and honey. Stir in the juice from the maraschino cherries, and half of the cherries. Score the outer edge of the ham with a sharp knife in a diamond pattern. Cuts should be about 1/4 inch deep. This will allow the ham to soak up the juice. Place the ham into an oven bag, and carefully pour the juice mixture over it, keeping all of the juice in the bag. It may look like there is too much juice, but the ham will soak it up while baking. 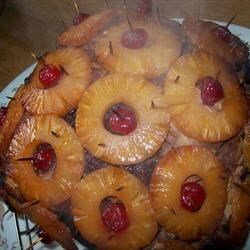 Place the pineapples onto the top of the ham, and secure with toothpicks. Place cherries into the centers of the rings, and secure with toothpicks also. Tie the end of the bag closed with the ties provided, place in a large roasting pan, and cut a few small slits in the top of the oven bag. Bake the ham for 2 hours in the preheated oven. The internal temperature should be 160 degrees F (80 degrees C) when done. Be sure not to touch the bone when taking the temperature. Remove ham from bag to a serving plate, and let stand for 10 minutes before carving. I made this for thanksgiving. The ham got eaten WELL before the turkey. Went over great and smelled SOOO good when it was cooking. I made sure to baste it ALOT.